Orgiva is the largest town on the western side of the Alpujarras, that unique area, south of the Sierra Nevada, in the writings of Gerald Brennan in South of Granada and Chris Stewart in Driving over Lemons, Parrot in a Pepper Tree and The Orange Blossom Appreciation Society. The area is surrounded by groves of oranges, lemons and olives, in this agricultural area and the town has that very Spanish character with restaurants and tapas bars, an attractive 16th century church with twin spires, and the market on Thursdays. 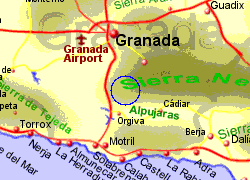 Orgiva is about 20 Km inland from the Granada coastline (known as the Costa Tropical due to the climate there) and at 450 m above sea level, not as high as much of the Alpujarras. 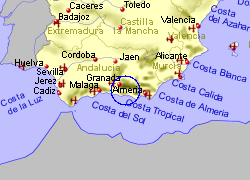 The town would make a good base for exploring the Alpujarras, Granada and the coast. 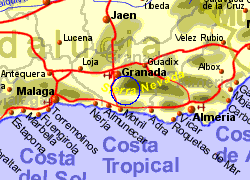 Map of the Orgiva area.